Currently, non-English users must select the language they want when responding to a survey. With the install, surveys are presented in the same language as the original web form the patron filled out to chat or send their question. When users add a question directly into QuestionPoint, they can select the language of the question. This simulates what happens in the html script that sits behind your QuestionPoint form on your library's web page. If your patrons are typically French-speaking, for example, you have set up that Web form to send e-mail responses in French. Now, if you add a telephone or walk-up question into QP with the patron's e-mail address, you can set the language so that all responses are also in French. Since state and province names can be entered into QuestionPoint profiles in free-text, there has been no standard way to search policy pages by state. With this install, all variations of a state or province are mapped to a single standard, which is listed in a drop-down menu for easy selection. See Illustration 1. All questions not yet rolled to the Service History or deleted can now be viewed in one list, All. This is the final option in the set of links that appears under the Questions tab or My Questions tab. See Illustration 10. All question lists now display time in hours, minutes, and seconds, e.g., 11:45:57. The left column of the My QuestionPoint home page includes the new link name Search Policy Pages. This link takes the user to the search page for finding institution policy pages. Developers have made several adjustments to refresh rates to improve the librarian experience. Chat librarians will notice a significant improvement in response time. Selecting queues is easier and more straight-forward than ever. You return to begin monitoring immediately after confirming your selection. Before you select a queue, red type notes that you are not monitoring any queues. After selecting queues, the red note changes to a black, indicating that you are monitoring live queues. At the top of your monitor, the number of queues you are monitoring is displayed. If you are in any IM sessions, the number of those sessions is also noted at the top. See Illustration 2. After the librarian sends a message, it appears in the transcript area without delay, addressing the problem of a perceived time lag. 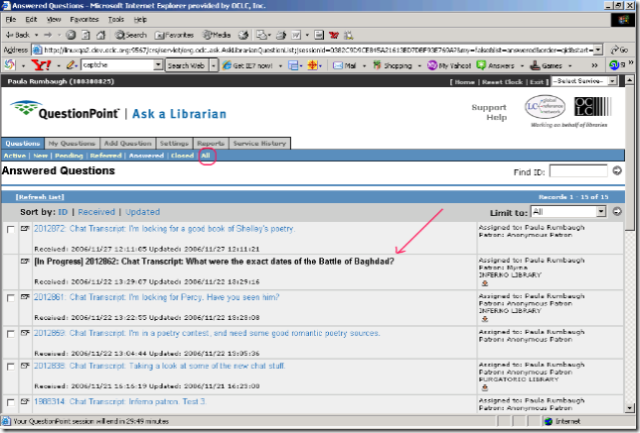 When needing to switch between patrons or back and forth between patrons and IM with another librarian, the librarian can mouse over the patron name to see the last message. This can reorient the librarian to where the exchange left off before reactivating the session. See Illustration 3. Visual connection-status indicators show when a patron is connected (green square), when the system has received no response from the patron for an extended time (yellow diamond), and when the connection between patron and system is broken (red circle). See Illustration 4. Each time the librarian switches to a different patron, the focus automatically goes to the end of the transcripts, rather than the beginning. 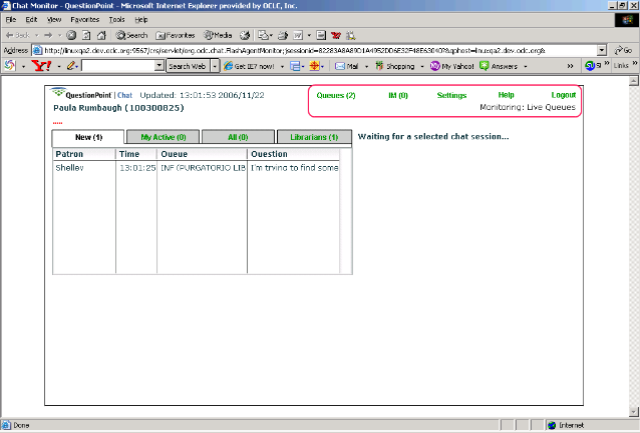 This allows the librarian to immediately see the most recent messages in context. 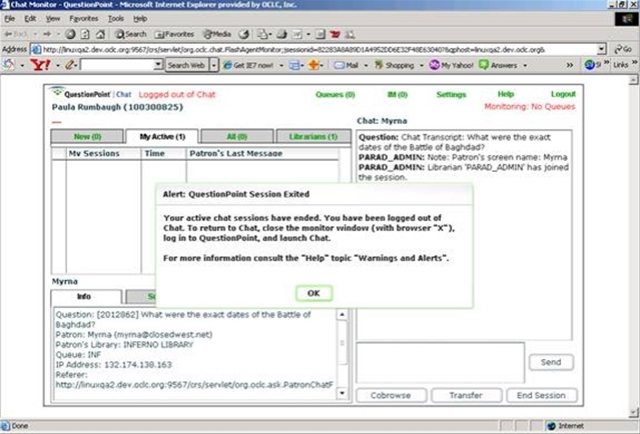 A new alert pop-up notifies a librarian when a chat session has been transferred to her and is waiting in her Active Sessions. If another librarian logs in using the same authorization as yours, you receive notification of this, with instruction to end your current sessions and close your browser window. See Illustration 5. 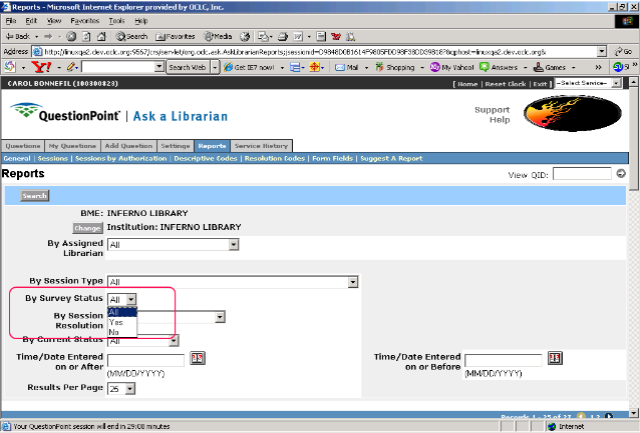 A pop-up window will alert the librarian if the QuestionPoint session was inadvertently exited. Instructions in the window tell the librarian to close the monitor browser, restart the QuestionPoint session, and launch another chat browser. See Illustration 6. Buttons and informational text areas have been resized to better accommodate non-English languages. This will facilitate translations and improve readability. If you have chosen to not send patron account information in e-mails (see Administration/Setting/CustomMessages), test buttons for the New Accounts and New Account from Chat options can be used to assure the feature is turned off. A new limit option is available for the General reports in the Ask module. Placed just under By Session Type, the new option allows the administrator to see only transcripts with completed surveys. See Illustration 7. Administrators can report on patron-supplied data (Ask/Reports/FormFields) for Question Form transactions (e-mail), for Chat Sessions, or for both. The drop-down menu where you make this selection is just below the institution name and before the date field. See Illustration 8. 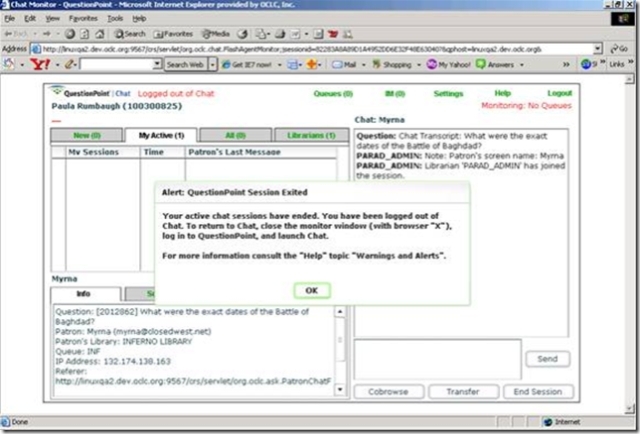 Administrators of libraries offering chat via the Flash-based service can get a report by resolution code. These statistics represent how the administrator’s librarians coded chat sessions at the conclusion of each. For libraries in the 24/7 Cooperative, this number is not concerned with the home library of the patron; only with how their librarians coded the session. See Illustration 9. 1. All languages are searchable from the Knowledge Base Basic Search screen. After an earlier install this year, non-English language searches containing diacritics had to be carried out from the Advanced Search screen, with the language limiter set. All searches, regardless of language, can now be searched from the Basic Search screen; diacritics no longer affect how you search a term. 2. 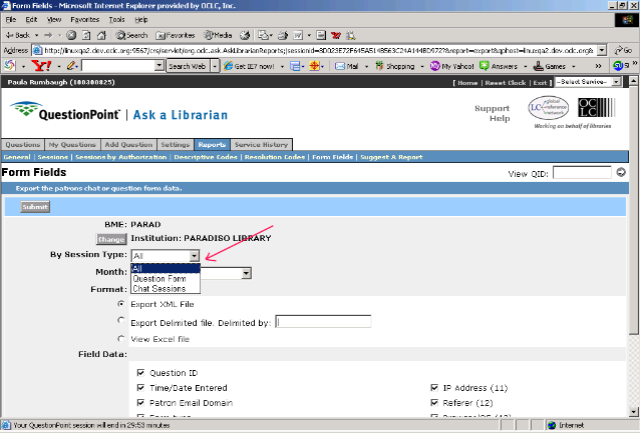 Answer text is saved during knowledge base search. If you now search the knowledge base after entering text in the Answer box and then cancel out of the search, you lose all the text you entered. With the install, that text is saved and still in the box when you return to the Answer page. 3. Form Fields report response time is greatly improved. The Form Fields report, available from the Ask/Reports, has been tweaked such that the response time is greatly improved. The report page should display immediately after you click on the Form Fields link. 4. Patron-account URL no longer on Acknowledgement page. If you have set your account to not send logon information to a patron, the patron-account URL no longer displays on the acknowledgement screen after the patron submits their question. 5. Live chat sessions no longer accessible outside chat monitor. 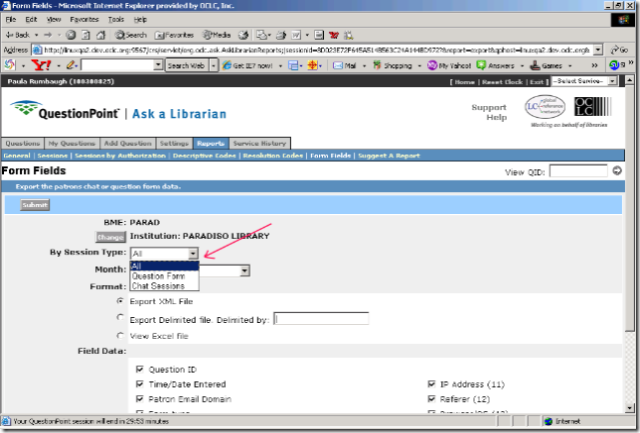 Librarians will see live chat sessions in their Answered questions list that are not hot linked—that is, they cannot open them to the Full Question view while the chat session is in progress. Live sessions are in black typeface and are preceded by [Session in progress]. Abandoned sessions (sessions never picked up by a librarian and sessions never properly ended) will remain in the question list for two-three hours before being “released” for further activity. See Illustration 10. 6. Administrators: The chat monitor All tab restricted to primary queue. The All tab in the chat monitor will allow you to look in on only librarians in your primary queue, rather than on any session in the queues your library is monitoring. We hope you find these helpful and remember that Help is always the best place to check first when you have a question. And it’s just a click away using the Help link at the top of every page in the QuestionPoint system. It’s important to always check your browser settings before your chat shift as the settings can revert after any IE change such as automatic IE updates and security fixes. Always check these settings first when you encounter a problem with QuestionPoint. 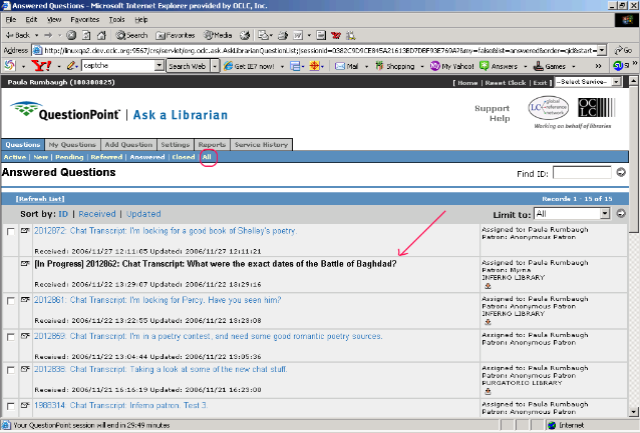 For more on what the browser settings should be, please check http://www5.oclc.org/questionpoint/Chat_setup.pdf. While QuestionPoint supports Flash 7 and Flash 8, we recommend that you use Flash 9. To check which version of Flash you have, visit http://www.adobe.com/shockwave/welcome/. 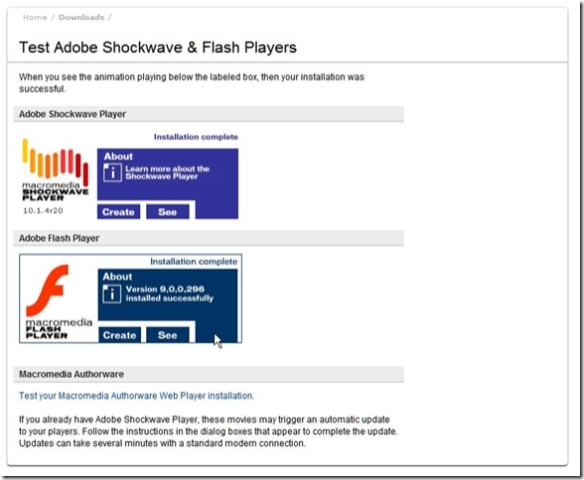 You may be prompted to install Shockwave when you visit this page but it isn’t necessary. To find your version, move your mouse to the About tab in the Adobe Flash Player box. The Flash player will be reinstalled automatically. In our first posting, we focused on tips and tricks for chat reference. But there are just as many great tips and tricks for email reference. So today we’d like to offer two tips. How can I quickly check my spelling in my answers before sending them? A spell checker is an essential tool for providing quality answers. Some librarians, when preparing a lengthy answer, will use Word to write the text and check its spelling and grammar there. Then they cut and paste the answer into the QuestionPoint Answer field. But a number of spell checkers are now available on the Internet. One such tool is ieSpell (www.iespell.com) for Internet Explorer. It offers different language dictionaries plus you can customize the dictionaries. While it is free for personal use, the author does offer discounts on both volume licenses and site licenses that make this software quite inexpensive. Firefox 2.0 goes one better. The latest version of this open source browser has an in-line spell checker built into it. This means if the spell checker is turned on, it will spell check as you type in web form, including those for the QuestionPoint Ask module, without having to purchase or install additional software. Why must I edit a patron reply before doing anything else on the transaction? Many of you have noted that replies coming into QuestionPoint from outside (from patrons, from e-mail partners) are sometimes difficult to understand, and the question history often repeats. QuestionPoint is not itself an e-mail server; it simply passes text to an e-mail server and accepts text from an e-mail server. It cannot recognize one kind of text (e.g., an e-mail header) from any other kind. Think of a reply from a patron as simply an e-mail message. 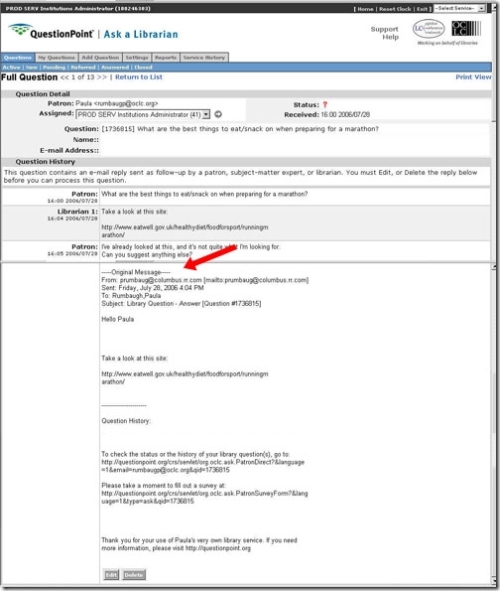 If the patron’s e-mail client has the retain-previous-messages utility turned on, a reply will include all foregoing text in the e-mail message to which s/he is replying. Most clients do work this way, unless the user purposely turns it off. If the foregoing text is not deleted before you save the patron’s message, you will have two versions of the transaction history saved! And when you respond, again, to the patron, everything in the history is sent once again. To read a reply, you need look only at the very top. When you see –Original Message— as in the example below, you are getting into “history” that is already recorded in QuestionPoint. The easiest thing to do is to click on Edit, delete everything up to and including –Original Message-, and then click Save. Now your history includes only the patron’s reply, and not the reply plus everything else in the original message to the patron! Welcome to the first in a series of QuestionPoint tips. These tips have been compiled by the QuestionPoint team after reading every feedback, comment and support message that has been sent to us since the QuestionPoint software was released in March 2006. Many of these tips apply directly to QuestionPoint while others fall under the heading of good computer practices. We hope you find these helpful and remember that Help is always the best place to check first when you have a question. And it’s just a click away using the Help link at the top of every page in the QuestionPoint system. Our first set of 6 tips come from our After Hours staff and deal with some of the best practices they follow as they serve the large number of simultaneous patrons that they work with. By doing this, you’re freeing your computer’s memory which will help improve your computer’s overall performance as well as QuestionPoint’s. The chat monitor runs in an Internet Explorer browser window, If you have more than two IE windows opened, your computer slows down to figure out which IE window gets which traffic from the Internet. This makes QuestionPoint appear slow. One suggestion to help limit the number of Internet Explorer windows is to use IE only for QuestionPoint and use another browser such as Firefox or Netscape for researching your patron’s questions on the web. When monitoring chat, it is critical to run only those programs that are essential for helping your patrons. Running more than one co-browse session on your computer at a time consumes a lot of your computer’s memory and makes it very likely that IE will crash. 5. Always end your patron chat sessions when they are done. Chat sessions that have been ended but not closed create unnecessary strain on QuestionPoint. 6. Always use the Log Out link in the chat monitor when ending your shift. As always, your comments are valuable to us so please feel free to post your feedback to these tips below. Look for the next set of tips on Nov 22. We are currently experiencing technical issues with QuestionPoint that may cause some performance slowdown. We regret the inconvenience and are working on the problem. 1) Please do not accept more than 2 simultaneous sessions. 2) Please clear your cache of temporary internet files. Please be reminded that due to the elections in the U.S., internet traffic is expected to be higher than normal.